When it comes to women, to look pretty, beautiful and attractive is one of the primary things to which a lot of attention is paid. Hair plays an important role in enhancing the overall beauty of a woman. Soft, silky, shiny, and strong appearing hair is what most of the women desire for. To them, dry and lifeless appearing hair is no less than a catastrophe and hence, it is necessary to know the methods through which such a scenario can be avoided. There are many hair products available in the market that claim to be effective; however, not only they are very expensive but also fail to deliver results as promised. So, is there any other way to get soft and shiny hair? Of course yes and the best part is that they are natural and not expensive at all. Below are some of the simple and effectual tips that you can follow staying at home itself and save a lot of money as you won’t have to spend anymore visiting hair salons. 1. Avoid excess usage of products for hair styling. The chemicals in them can damage your hair and give them a dull look. 2. Make a mixture of rice vinegar and an egg yolk. Apply it on your hair after washing. Use a towel to cover your hair in order to avoid drying out of the paste. After an hour, wash your hair using plain water. 3. Mix one cup each of vinegar and water together and use it for the final rinse after you shampoo your hair. This will help you in giving your hair a silky and shiny look. If you are worried that your hair would smell vinegar, then don’t be as smell will not last for a long time. It would be completely gone within 30 minutes. 4. Did you know that juicy strawberries can also be helpful in improving your hair condition? In fact, with strawberries you can get a shiny and rich looking hair. Smash 4-5 strawberries and mix it with a tablespoon of mayonnaise. Apply this paste on your already washed hair and leave it to dry for about an hour. Wash away this strawberry paste as usual with shampoo and conditioner. 5. Oil massage is another method through which you can get soft and silky hair. Take a quarter cup of olive oil in a plastic bottle and warm it up by keeping it in warm water for about ten minutes. Massage your hair using this oil and leave it for fifteen minutes. Wash your hair with lukewarm water and get amazed with the positive results. 6. To an extent as much as possible, try not to use hair-dryer to dry your hair. Make use of a towel or leave the hair to dry on its own. If you are running on a tight schedule that doesn’t allow you to take so much of time and hence necessitate the use of high-heat drying method, then make sure that you use a silicone-based spray for hair protection. 7. 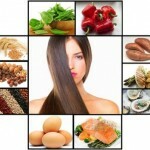 Certain food items too help in improving your hair condition. Try including almonds, apricots, and black sesame seeds in your diet as it assists in improving hair shine and texture.